is a sure value within this promising and still too confidential wine appellation of Cassis. Emile Bodin was born in Marseille on November 6th, 1881. In 1883, the severe epidemic of cholera forced the family to leave Marseilles for Cassis. She settled in the family-run country house, which became the famous mas "Calendal". At the age of 13, Emile Bodin, orphaned by his father and mother, was raised by his aunt. At the age of 18, as a self-taught artist, he began to renovate the adjoining vineyard, which, as elsewhere in France, had been devastated by the phylloxera. In 1901, with his friend Jules Savon, he used for his grafts, plants brought back from Texas, whose roots resist this parasitic aphid. They were the precursors of a different, dry and mineral wine, which was able to draw all the richness of the clayey and limestone Cassidan soil, previously renowned for its muscatel. 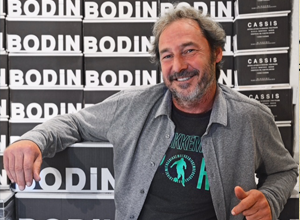 Emile Bodin is the first in Provence to sell his wine in bottles. The brand "BODIN" is then deposited and recognized throughout the world. In 1918, the property was completed by the acquisition of Château de Fontblanche. Defender of the environment, in the noblest sense of the term, botanist, this "mad lover of Cassis" is also majoral Félibrige. He befriends the famous poet, Frederic Mistral, who describes his wine by dedicating these verses to him: "The bee has no sweeter honey, it shines like a limpid diamond, smells of rosemary, heather and myrtle, which cover our hills and dance in the glass. 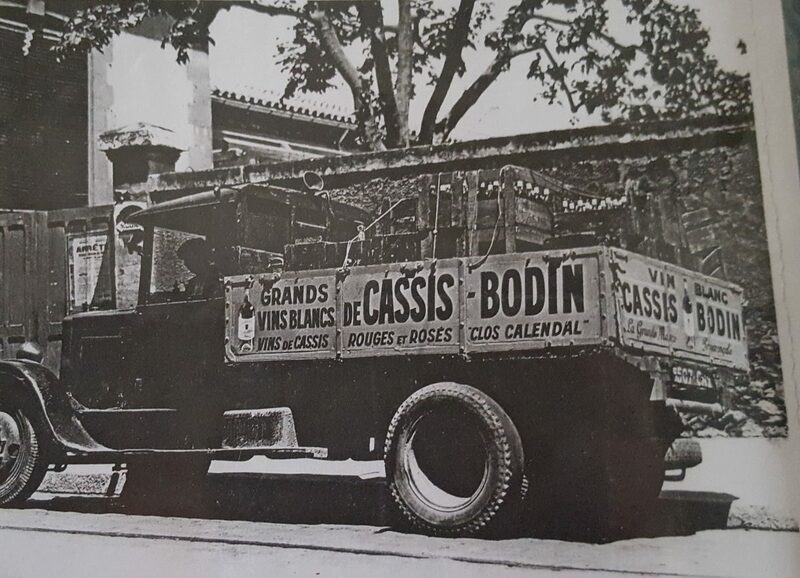 On May 15th, 1936, Cassis obtained the protection of the appellation contrôlée, making it one of the oldest, with Châteauneuf du Pape, Arbois, Monbazillac and Tavel. After his death in 1969, at the age of 88, his daughter Madeleine, wife Bontoux, naturally pursues the work initiated by her father. 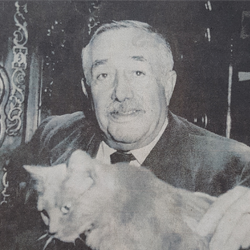 In 1973, his grandson Jean-Jacques, began the construction of a new cellar, with more adapted techniques. Today, Nicolas, supported by his son Emile, follows the path of his elders, with the same determination and the will to innovate. The development of new vintage raised in acacia barrel for white and oak for red, as well as the reimplantation of Muscat, a grape variety disappeared from the appellation, which had made it possible to write the first letters of Nobility of the wines of Cassis. No doubt, that the two men, driven by the desire to amaze, still book many surprises !!! At the side of the Mediterranean Sea, in the heart of Provence, the appellation area of the wines of Cassis is located on the Commune of the eponymous city in the department of Bouches du Rhône, in South of France. One of the smallest appellations and yet recognized for its quality and its typicity since 1936, as an area of appellation controlled "AOP Vin de Cassis", just as were Chateauneuf-du-Pape, Arbois, Monbazillac and Tavel. As for her sisters, the precocity of the recognition of the Cassis wines characterizes an exceptional wine. A few steps from the famous Cassidan cliffs overlooking the Mediterranean Sea, the 30 hectares of the Domaine are there! Situated in the heart of a natural geological circus, working like a rampart at the sea entrances, regulating the freshness necessary to the blossoming of the vine ... the Mistral does its work. Strong and steady, this Rhone Valley breathes the precious vineyard of all superfluous moisture. 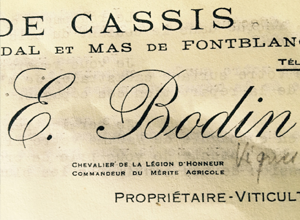 The Cassis Bodin vines have been cultivated in goblets for more than a century and are grown according to the precepts of reasoned agriculture. 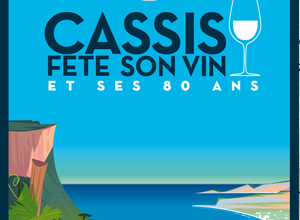 True local heritage, the marsanne, clairette, ugni blanc, sauvignon, grenache, cinsault and other mourvèdre produce this fabulous nectar that is the Wine of Cassis. Discover the typicity and the originality of our wines, recognized by the greatest chefs and connoisseurs of fine wines. The sale of alcohol is prohibited to minors under 18 years in France. Alcohol abuse is dangerous for your health, should be to consume with moderation. This site is not directed to children under 18 years.